The younger set may have mixed feelings as the summer winds down, but for many Methodists in ministry, the days right before school starts make up the most wonderful time of the year. Madeline Baum, who leads the family and student ministry at Trinity UMC, Jensen Beach, said it’s her favorite season. Her church held its third annual Back-to-School Fair, including a backpack giveaway, on Aug. 3. 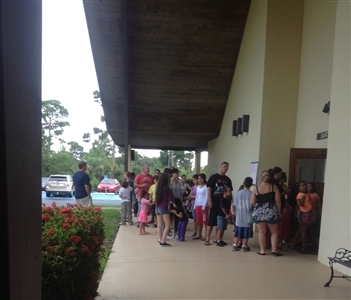 A long line stretches around Trinity UMC, Jensen Beach, as families sign up to receive free backpacks and school supplies. Photo from Madeline Baum. Trinity is one of many United Methodist churches in the Florida Conference stuffing backpacks with school supplies and collecting clothing and shoes to give children who might not otherwise get off to the best start for the 2013-14 school year. Baum said the congregation handed out 342 backpacks that were filled according to whether students were in elementary or higher grades. Some churches, like Trinity, make a community party of the annual giveaway, offering food and entertainment and helping youngsters in need get medical checkups or screenings and haircuts. In the case of First UMC, Baldwin, a get-together Aug. 10 included a representative of the Duval County public library signing kids up for library cards and showing them online study services they can use through the library. “The library … has a hard time getting parents to come in, [and] the parents have to sign for the kids to be given a card,” said Pastor Dan Search of the Baldwin congregation. The Baldwin church, which typically sees a Sunday worship attendance of about 45, teamed up with three Baptist churches and one Assembly of God congregation to host the backpack distribution festivities. Search said the five churches received enough donated school supplies to fill 400 backpacks. From left, Liz and Emily Lear, Austin Parriott and Tryston Brewer lead guest families in praise as they wait for the backpack distribution at Trinity UMC, Jensen Beach. 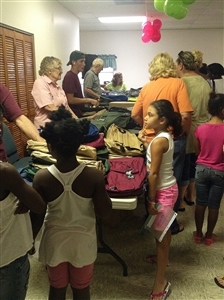 Children report to the backpack distribution table staffed by volunteers from Trinity UMC, Jensen Beach. Photos from Madeline Baum. The event included a puppet show, music, hot dogs and ice cream and an 80-foot-long table piled with clothes to be given to those in need. Volunteers also handed out healthcare kits and bags of food. Any left unclaimed are distributed to children in need at Sunday worship services, the pastor said. “It’s really awkward for a kid to go in the first day and not have what they need to start school,” Search said. First UMC, Chiefland, also teamed up with four other churches and staged a community event, dubbed the “Epic End of Summer Bash,” that combined the distribution of 500 backpacks with other community services. More than 900 people attended, said Diana Child, the church office administrator. The local Guardian Ad Litem program sent a representative to recruit volunteers to help children who find themselves in the court system, and more than 10 people gave blood at the LifeSouth Bloodmobile on site. In addition to free food, hair care products, clothing and haircuts, “an untold number of prayers were sent to heaven,” Child reported in an email. Other churches are gearing up for after-school tutoring or helping teachers and school administrators get campuses ready to welcome students this month. 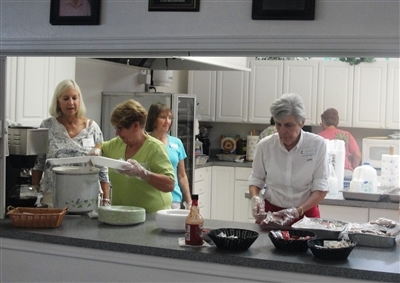 Volunteers prepare to serve food to children in a summer feeding program at First UMC, Bonita Springs. Photo from Stephen Lane. First UMC, Bonita Springs took over feeding more than 50 children breakfast and lunch for the last two weeks of the summer break, said church member Stephen Lane in a posting on the Florida Conference Facebook page. That allowed Bonita Springs Elementary, which had been providing the meals on campus, the opportunity to close and focus on getting classrooms and teachers ready for the first day of school. In Jensen Beach, Trinity UMC’s back-to-school ministry stemmed from a desire to help residents of a community that has faced high unemployment rates since about 2007, Baum said. Families from nearby Port St. Lucie also attended this year’s event. About five years ago, the church was putting money into outreach efforts that would attract young families. At the time, Baum recalled, there were only about three in the congregation. The church council decided to forgo some events like picnics and put donated funds toward the backpack giveaway instead, Baum said. Since then, the youth and families ministry has grown to about 100 people. More than 40 people signed up for more information about the church at this year’s event, Baum said, and at least two families who had attended the backpack bash came to church for Sunday worship afterward. The Back-to-School Fair generates enthusiasm for both volunteers and guests, Baum said. Community members usually start showing up two hours early and enjoy praise music in the sanctuary.